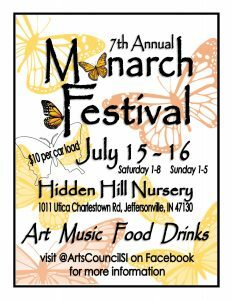 This year’s Monarch festival, hosted annually by the Arts Council of Southern Indiana to celebrate and help protect the species, is taking on a new look. The festival, which has traditionally been held in downtown New Albany near the Arts Council building, will be at Hidden Hill Nursery in Utica from 1 to 8 p.m. Saturday, July 15 and 1 to 5 p.m. Sunday, July 16. The festival is designed to celebrate the butterfly as it embarks on the annual migration to warmer areas in Mexico and the Southern United States, and to educate on how people can help the species which is in danger each year due to habitat loss and pollution. 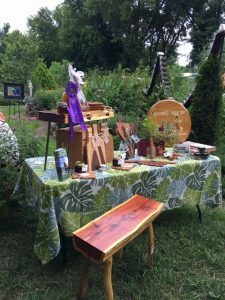 There will be a sculpture show, other local artists, vendors and performances and activities for the whole family, including an annual butterfly release. The cost is $10 per carload of people and proceeds benefit the Arts Council. Families can make the celebration an all-day affair, bringing a picnic and visiting one of the many lush gardens and greenhouses at the nursery, which specializes in rare plants. There are train gardens and caterpillar gardens and kids’ gardens and adult gardens — there’s just so much to do and see. It’s the perfect place to have it. The butterflies are going to be happy campers. There’s something for everyone at the 7th Annual Monarch Festival Bob Hill’s Hidden Hill Nursery and Sculpture Garden on July 15 and 16 — art demos, crafts and activities for the kiddos, a butterfly release each day at 4pm and some libations for the grown-ups from NABC Cafe & Brewhouse and Turtle Run Winery and Best Vineyards and Winery. Oh yeah! • COST: $10 per carload — includes family activities, butterfly release, live music and performances, food vendors, vendor and artist booths and demonstrations, unique gardens.